Zig fishing can be a deadly method in summer when the carp are feeding in the upper layers. Rob Hughes is here with his top tips…. Rob has been absolutely battering the carp on a number of waters recently and zigs have been a big part of his success. Not everyone has the confidence to fish zigs though, but they really are a tactic you need to have in your armoury. With a few tips from the top you too could be out filling your photo album with zig caught carp this weekend. Here’s Rob’s tips for success. Spodding over zigs is absolutely fantastic. Great fun and on high stocked waters you can catch multiple amounts of fish in short day sessions. It’s a really active method but you’ve got to work at it. The best type of water to fish this method is high stock and prolific venues. As a starting point plumb the depth, set your zig about three quarters of that e.g.6 ft in 8ft of water, 9 in 12, etc and then get spodding over the top. You’ll need a very cloudy smelly sloppy mix that should sink slowly through the water leaving a big cloud of scent and as well as the odd floating particle. 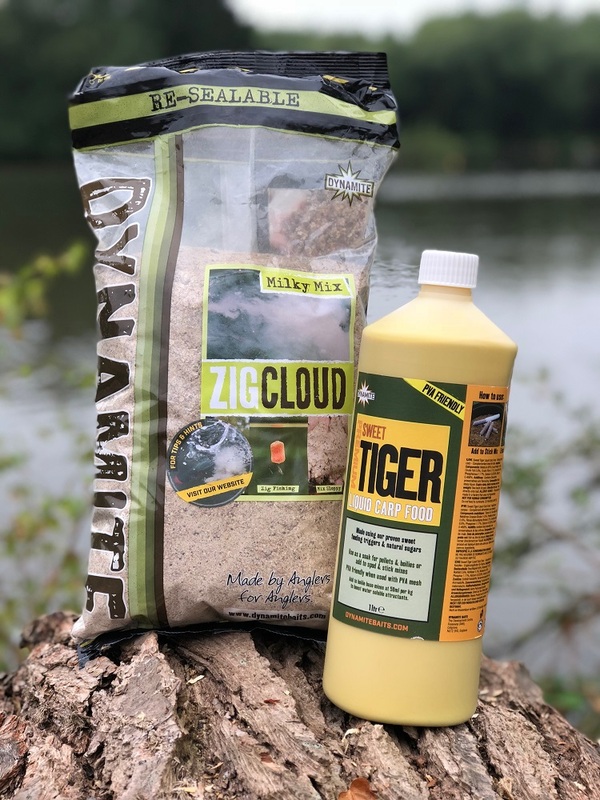 Dynamites Zig Cloud Milky Mix combined with Sweet Tiger Liquid Carp Food is an absolute winner that was designed for exactly this purpose. Even better, you don’t need anything else other than a little bit of lake water just to slop it up. Fish a Fox black zig aligna with yellow foam in it and you won’t go far wrong. Put 12 spods in at the start, then another three every 15 mins until you start getting action. Once you do…. keep feeding. Fishing zigs on low stock venues is a very different proposition to hi-stock venues. 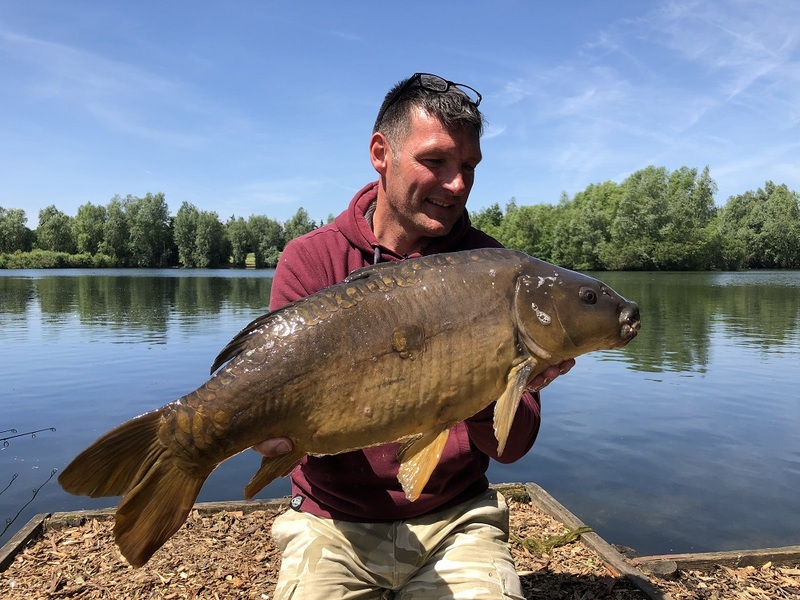 With a high stock venue you’re using food to attract the carp in and develop a competitive feeding reaction, but on lower stock venues you are aiming to place your zig in front of fish and fool them into taking it, thinking that it is a fly hatch. Black zigs are the way forward here, but a lot of people don’t have confidence enough to use them. Slinging a piece of flip flop out into the pond on the off chance, with no bait around it it’s too much for a lot of anglers. It does however work, and it’s only your confidence that needs to boost. To do that one give it a lick of flavour which will increase it’s attraction. 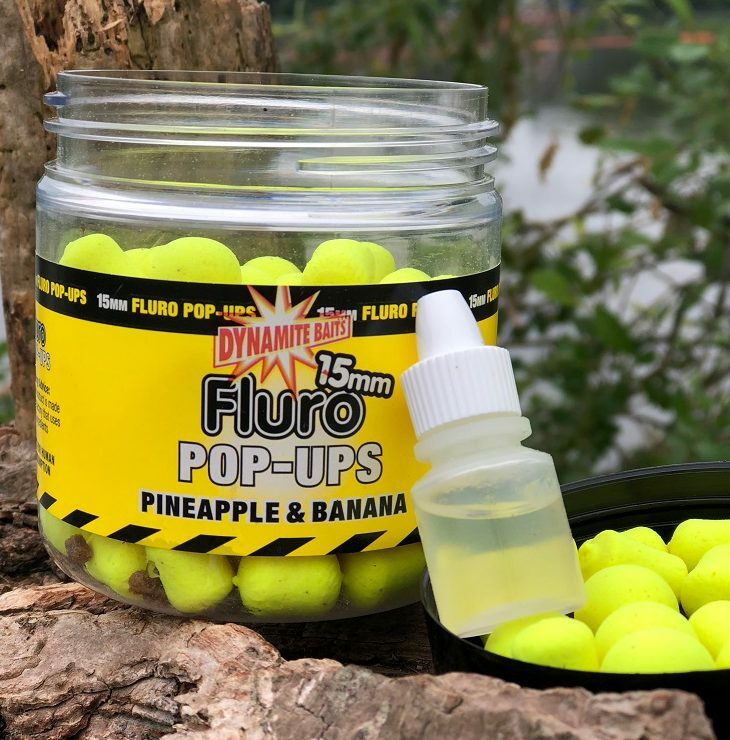 In every part of Dynamite Flouro pop-ups there is a booster pot containing flavour. These are great for pop-ups but also brilliant for zigs as well as the foam absorbs the liquid really well and turns the Zig from a visual trigger to a smelly one too. Winner! 3. 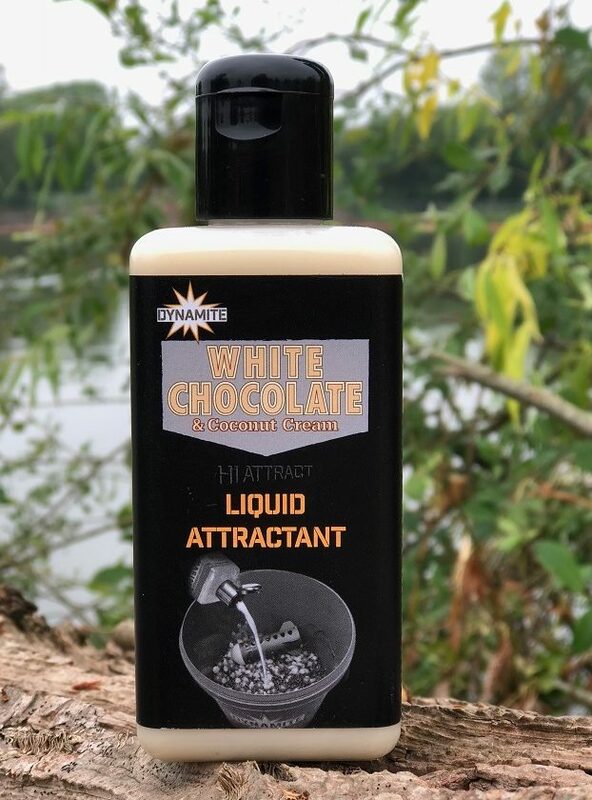 I’m going to give a way a bit of an edge here….One of my favourite attractants to go into a mix when spodding over zigs is Dynamite White Chocolate and Coconut Cream Hi-Attract liquid. Open a bottle and tell me you don’t like it…. It colours and clouds the water and adds a beautiful smell. Carp have a sweet tooth and there isn’t a carp alive that doesn’t like white chocolate and coconut. For a real added edge, when you put it into your mix, add some hot water to. The hot water will make the liquid attractant spread out through the water even quicker bringing carp to your spot much faster. It’s an absolute winner and then edge I have been keeping quiet until now.